Merri Travels on Endurance.net: A Grand For Jose! Jose received an envelope in the mail! Who was it from? The AERC (American Endurance Ride Conference). What was in it for this special horse? Was he impressed? 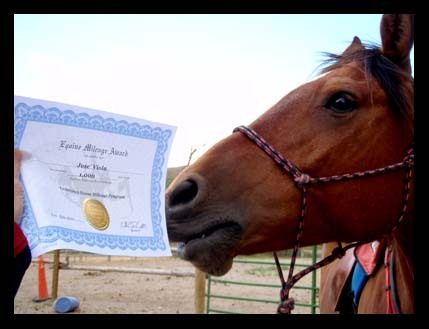 Well, he inspected it closely, but I think that he thinks that every horse that gets a thousand miles should get a bucket of carrots from AERC. 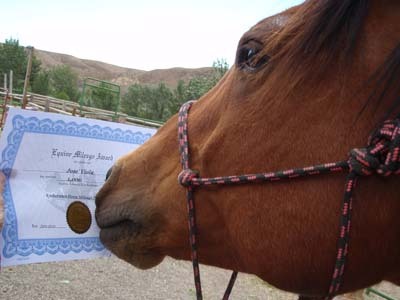 We get to frame his certificate, he gets to eat the bucket of carrots. Owyhee Fandango Day 2: It's All About The Trail!